Location: Kobe City, Hyogo Pref. A national seclusion policy was enforced in Japan from the middle of the 17th century. Foreign contact in the closed country was strictly limited to a single locality and religious association was totally forbidden. In the middle of the 19th century the country was opened to foreigners after two centuries of seclusion. People of various nationalities and religions came to Japan from overseas and, mainly in port towns, residential quarters for these foreigners emerged. At that time, Kobe was one of the towns with the largest population of foreign residents, and this fact alone made for a diversity of religions. 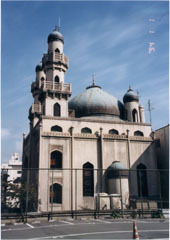 The picture shows the Islamic mosque that was built in the former foreign residents' quarter of Kobe. The mosque is a three-story reinforced concrete structure that was built in 1935. Capped by Byzantine onion-shaped dome, and crowned by a crescent, the mosque still attracts Muslims to prayer. It is said that in the early days the Muslim congregation in Japan used to include a large number of Japanese who entered the faith while living abroad. The religious organization before the Second World War was so active that there was a system of annual pilgrimages to Mecca. 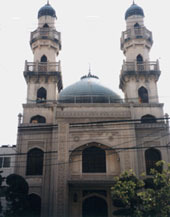 As Islamic studies flourished, a mosque was also built in Tokyo. The defeat of war dealt the religious community such a blow that it was nearly wiped out. Today it is said that there is about 50,000 practicing Muslims in Japan. Photos: Islamic Mosque in Kitano-cho, Kobe (JCIC).